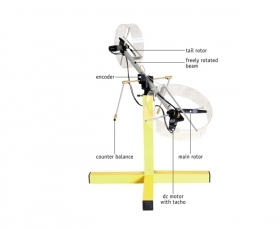 Two Rotor Aerodynamical System (TRAS) is a laboratory set-up designed for control experiments. In certain aspects its behaviour resembles that of a helicopter. From the control point of view it exemplifies a high order nonlinear system with significant cross-couplings. TRAS consists of a beam pivoted on its base in such a way that the beam can rotate freely both in the horizontal and vertical planes. At both ends of the beam there are rotors (the main and tail ones) driven by DC motors. A counterbalance arm with a weight at its end is fixed to the beam at the pivot. The state of the beam is described by four process variables: horizontal and vertical angles measured by encoders fitted at the pivot, and two corresponding angular velocities. Two additional state variables are the angular velocities of the rotors, measured by speed sensors coupled with the driving DC motors. In a real helicopter the aerodynamic force is controlled by changing the angle of attack. In the laboratory set-up the angle of attack is fixed. The aerodynamic force is controlled by varying the speed of rotor. Significant crosscouplings are observed between actions of the rotors. Each rotor influences both position angles. A design of stabilising controllers for TRAS is based on decoupling. The TRAS system has been designed to operate with an external, PC-based digital controller. The control computer communicates with the position, speed sensors and motors by a dedicated I/O board and power interface. The I/O board is controlled by the real-time software which operates in the MATLAB/Simulink RTW/RTWT environment. 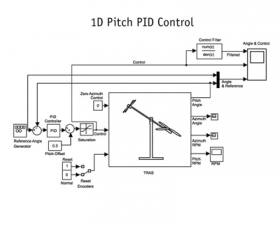 A pre-programmed library of controllers and Simulink models supports the TRAS system.